Uber is no stranger to regulatory battles, but it’s certainly getting more creative in how it fights them. As New York City Mayor Bill de Blasio looks to put new limitations on the ridesharing giant, Uber has struck back with a clever app feature meant to rally support among users. Customers who open the Uber app in New York City will now find a “de Blasio” option alongside the uberPOOL, uberX and UberBLACK options. 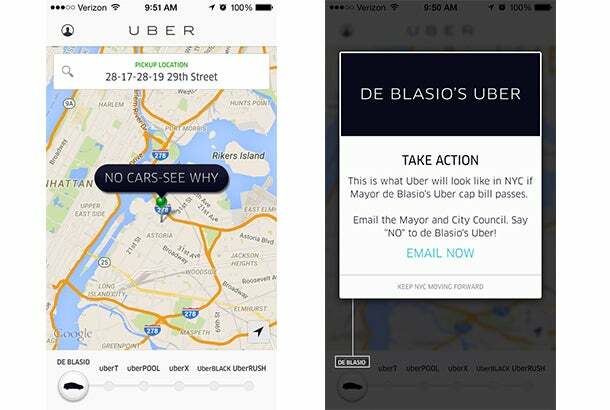 If you toggle over to that icon, a message pops up “NO CARS -- SEE WHY.” If you click on that bubble, Uber displays a screen that comes up informing users “This is what Uber will look like in NYC if Mayor de Blasio’s Uber cap bill passes.” In other words: There won’t be any rides available. At issue is a city council bill that would require the Taxi and Limousine Commission to limit the issuance of for-hire vehicle licenses until research is completed on the growth trajectories in the taxicab and for-hire vehicle industries. The cap on new for-hire vehicle licences would remain in effect until either the study is completed or August 31, 2016. Uber has been aggressively campaigning to raise awareness of the bill. In addition to the message embedded into the app, the San Francisco ride-sharing giant has been running television spots, like the one embedded below, highlighting the benefit that the app provides to the people of New York. Uber is threatening the legacy world of yellow taxi cabs in New York City, a deeply entrenched industry that has historically come with expensive barriers to entry. New York City is one battle in a larger war that Uber is fighting. The transportation company consistently finds itself butting heads with regulators. Earlier this week, the company was ordered to pay $7.3 million by the California Public Utilities Commission for not disclosing information on accidents involving Uber drivers, the percentage of rides Uber does not accept and how often Uber is able to meet demands for disabled accessible rides, among other information.